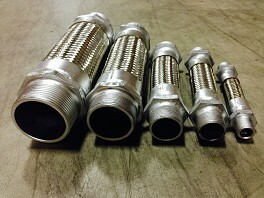 BFMC-MTE and BFMC-GE Stainless Steel Braided Flex Connectors. KINFLEX™ Seismic Flex Connectors eliminate pipe motion caused by thermal pipe growth and the movements associated with seismic activity. The Seismic “V” loops offer the benefit of using limited space for installation and the ability to hold in heat compared to traditional large “U” pipe loops. The “V” comes in a variety of styles and construction types to meet the requirements of your application.